Nothing is sadder than coming across the remains of an improperly locked bike. The mistake here? Locking only the front wheel to the bike ring. The thief just flipped the quick-release lever on the wheel, and bye-bye bicycle. By the Bike Maven | Spring is here and with it legions of cyclists are venturing back out on the streets. 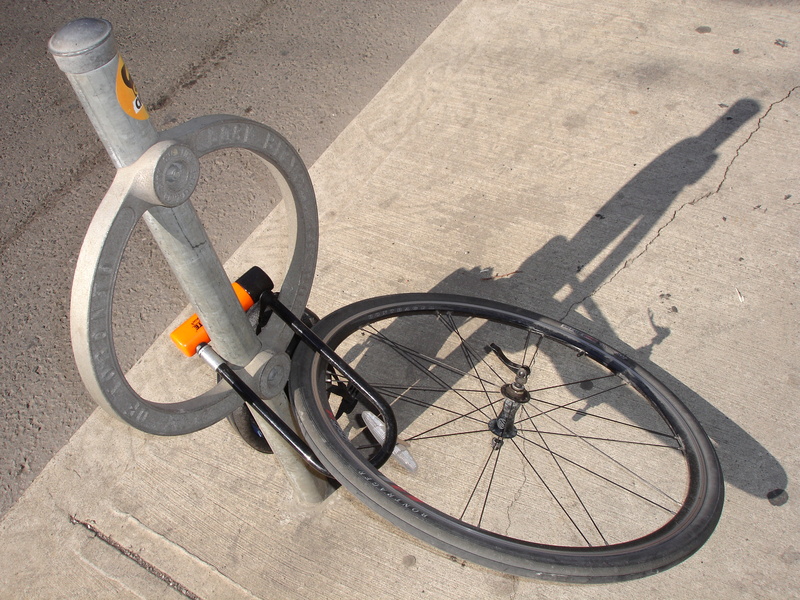 Which reminds me of a subject of perennial puzzlement: in a city as bike-mad as Toronto, why do so few cyclists know how to properly lock their bikes? 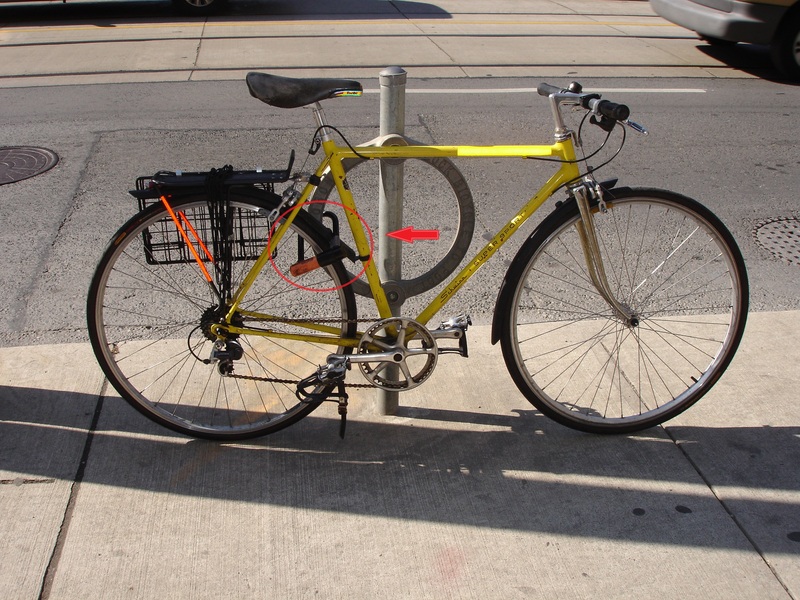 Bicycle theft is a major deterrent to cycling in Toronto. Even with Igor Kenk out of business, Toronto is still one of the bike theft capitals of the world. And don’t think your cheap beater bike is immune to the vermin bike thief. It can and will get stolen if you aren’t careful. A bit of thought goes a long way to deterring bike thieves. I say deterring because there is no way to make your bike completely theft-proof. 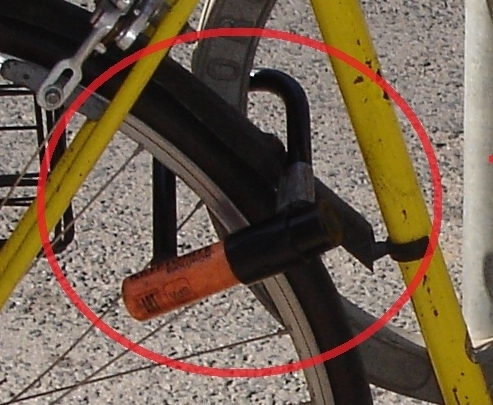 I’m going to talk today about how to secure your bike with a single lock. Yes, you can nail it down even further with multiple locks, chains and cables, but who wants to ride around the city burdened with all that heavy paraphernalia? Replace your quick release skewers, right, with a set that requires a wrench or allen key to remove, left. So let’s start by at least making it a little harder for thieves to take your bike or its parts. First, replace the quick-release skewers on your wheels and seat post with a set that needs a wrench or an allen key to remove. Conversion kits are available at your West Annex LBS: Bateman’s, Curbside, and Sweet Pete’s. There are fancy anti-theft skewers out there for $45 a set and more, but the simplest sets starting at about $20 will do. Next, invest in a good quality lock. U-locks (like Kryptonite) are more secure than cable locks. And I believe the smaller the U-lock the safer it is. Why? Because smaller makes it harder for a thief to get an instrument in the U to lever it open. My lock of choice is the Kryptonite Evolution Mini. For a U-lock, it’s light and easy to carry. So what’s next? The biggest mistake most cyclists make when locking their bike comes when selecting which part of the bike to lock to the bike ring. The most expensive part of the bike is the frame, followed by the rear wheel with its cassette of gears. 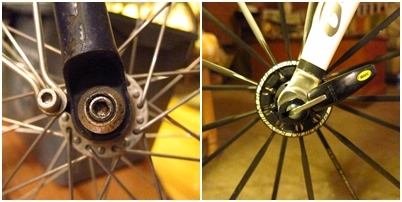 In fact, if you have an internally geared hub on the rear wheel as is becoming popular these days on city bikes, the entire (and expensive) gear system is in the rear wheel. Really, relatively speaking, the front wheel is pretty cheap to replace compared to the rest of the bike. So why do some cyclists insist on locking the front wheel and leaving the frame and the rear wheel unsecured? I think the answer is that most non-mechanically inclined riders find it harder to remove the rear wheel than the front since they have to disengage the chain from the cassette. They reason that the rear wheel is less likely to get stolen. Wrong. Anyone with a bit of experience can remove the rear wheel in a snap. So how to lock your bike? The best way to lock your bike securely? Within the bike frame’s rear triangle, lock your back wheel to the bike post. Yes, I know, it seems a little freaky at first because the bike frame itself is not locked to the post, only the rear wheel is. But the rear wheel rim has tremendous strength. It’s built to carry most of the rider’s weight and to resist the torque placed on it by the chain and the derailleur. That with the tension created by the spokes means that only the most determined of professional bike thieves are capable of cutting through a wheel rim. And so long as you catch the wheel within the bike frame’s rear triangle with the U-bolt, it’s impossible to separate the wheel from the frame. I learned this technique from my personal bike guru, the late great Sheldon Brown. His Lock Strategy article is worth a read, as is everything on his comprehensive website. Yes, thieves can still take your front wheel. But they won’t bother, since the owner of the bike locked next to yours hasn’t read this article, and his rear wheel is available to rip off. * Note: the City recommends that you lock to the bike post, not the bike ring as pictured above. Thank you to Jody Levine for pointing this out. The Bike Maven is a Serotta-certified bicycle fitter who lives, works, and cycles in the Annex. Visit his blog at www.TOmaven.wordpress.com. For other articles like this, visit the Bike Maven archive. Thanks for your message. Since this article was written, I too have moved to an Abus lock–in my case an Abus Granit Futura 64 U-lock. The lock is ultralight, has a longer shaft to make locking the frame and wheel easier, and has a double-locking shackle so both parts of the U have to be cut to fully remove the lock. I like your Abus 6000 folding lock too. It is considered only only slightly less theft-proof than the 64, and the folding design really convenient and space-saving. It was a toss-up for me which one to buy, but ultimately, the decision was made for me when I received the 64 as a gift. They’re both made in Germany, and you know the Germans make good stuff. I would personally recommend the Abus 6000 lock. It’s a concertina style steel bar lock that folds up into a neat case that can be mounted on the frame via the two bolt holes for things like water bottle holders. Fold it out however and you have an excellent lock, virtually impervious to bottle jacks and pry bars due to its tight fit and equally as impervious to bolt cutters due to its heavy steel bar construction. It’s not a cheap lock, I payed about £60 here in the UK for one. But having tested it personally with a bottle jack and pry bar, of which both had little effect on it except scratching it.